Srinagar: No matter how hard you try to live a normal life in Kashmir, the truth is that in this conflict-ridden Valley, a moment can completely change the course of your life; often for the worst. Take the example of 28-year-old Mohammed Ashraf Wani, a resident of Rahmoo village in Pulwama district of North Kashmir. Before August 24, 2016, it would have been nigh impossible to find him at home during the day as he was dividing his time between studying and working at Airtel. When not studying for his graduation, Ashraf worked with the telecom major as a field officer, recovering outstanding bills from customers. But after the encounter of Burhan Wani, the region was united in protests, and Ashraf was no different. “That day people were protesting at Prichoo, Pulwama and I was also a part of it. We were peacefully registering our protest and I had even asked a police offer to let us do peaceful protest but he didn’t allow it. Soon, the arguments lead to stone pelting between protesters and security forces,” recalls Ashraf. Ashraf tried to move to a corner in order to look for a safe corner. But one of the officers from a CRPF vehicle started firing at the protesters, leading to the death of two people and six people injured. Ashraf was one of the injured that day, and like thousands of others in Kashmir, his life has never been the same again. “I was hit by a bullet in the back which pierced my liver, touched one of my lungs and came out through the chest,” he said. And yet, Ashraf, who was on a ventilator for the next six days, was discharged two weeks laterand advised to rest for three to four months. On October 31, 2016, when he was still recuperating from the bullet wounds, the village witnessed another round of protest early morning. Ashraf still carried bullet wounds and did not want to be found out by the security forces. So, he tried to move to a nearby hill- Lidergan, surrounded by a dozen houses, hoping it would be safe there. As he climbed the hill, security forces, who were chasing other youths, also climbed the hill and fired pellets indiscriminately, along with tear gas shells on people. Finding it difficult to move, he tried to hide behind a tree, but a policeman aimed his pellet gun at him and fired, leaving Ashraf in a pool of blood. Even after six surgeries, pellets remain all over his body and Ashraf, a budding student and an employed person, was left to recover from bullet and pellet injuries. A year and a half after the fateful day with his hair closely trimmed and his black beard cropped short, he is still recovering from his wounds with fortnightly visits to the doctors in Srinagar. But that does not deter him from thinking about the concerns and welfare of other such victims who suffer like him and who are enduring what he has gone through. “I have gone through this pain and only I can understand the pain of those who were crippled by the pellets and bullets,” he said. 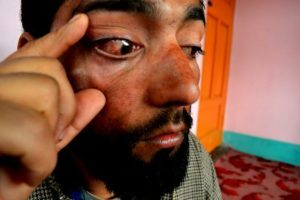 Nine months back while lying down on a mattress, wearing dark glasses at his single-storey mud house in the corner of a field, hiding behind a tin gate at Rahmoo village, Ashraf met few pellet victims from his area who shared how living a normal life has become a burden for all of us. He further said that the government has left them at the mercy of God after crippling them. “The government says that they have given us the jobs but we haven’t taken any jobs. They have given jobs to 13 pellet victims, most of whom are their party workers,” he said. In May 2016, Ashraf finally registered a not for profit trust “Pellet Victims Welfare Trust” in Srinagar which has approximately 1,250 pellet and bullet victims as its members. “Many NGOs and individual groups collect donations on our behalf, but nothing concrete is done for us due to non-streamlining of the funds,” Wani said. 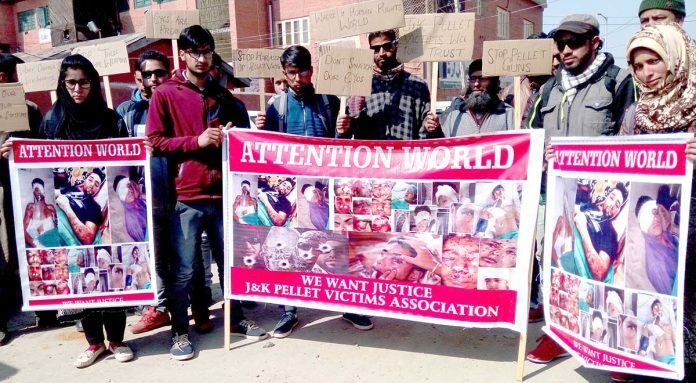 Last month on Feb 19, Wani along with the members of the Trust- mostly the pellet victims, held a sit-in at press colony Srinagar seeking an end to the use of pellet guns and justice as well as public support to help poor pellet victim families. “We had no other option left. The government has done nothing for us and we haven’t been given any jobs and it became important for us to hold a sit-in and clear things to our people and tell them how we are suffering silently,” said Wani. Wani’s trust is presently receiving little amounts as donations from the general public which the Trust is utilising to pay the medical bills and helping the pellet victim families. “Right now we are focusing on paying for their treatment,” he said. “Insha Allah, we are looking forward to helping them get an education and undertake other welfare-related activities for them,” he added.